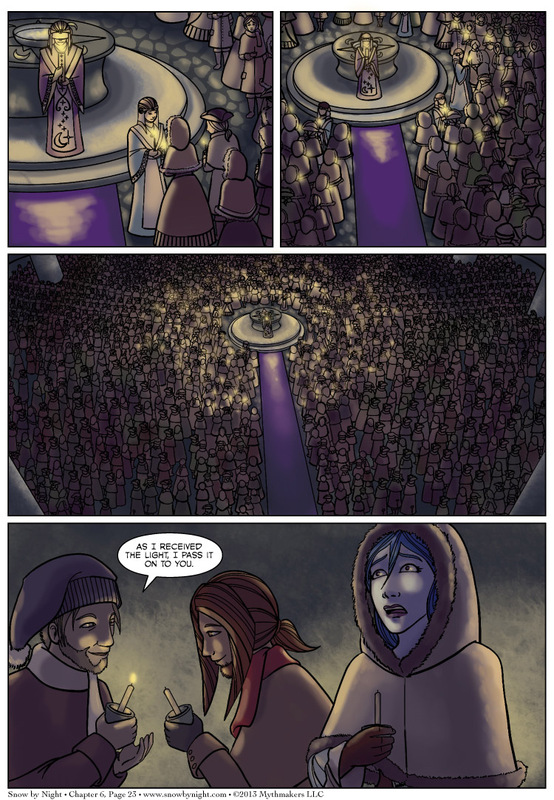 The light is passed on from one colonist to the other, but Snow-by-Night sees something that is causing her some alarm on Chapter 6 Page 23. I can’t really show you a preview from Wednesday’s page without ruining the surprise, so the vote incentive is the sketches that Brittany did when designing the vestments for the clergy of Giavere. To see the sketches, please vote for Snow by Night on Top Web Comics. Oh, I just got official notice from the USPTO. They’ve approved our trademark application. So Snow by Night is now a registered trademark. Woo hoo! Looks like worry to me. Nice work on the glow spreading through the crowd. I got what was happening immediately. Also cheers on the trademark! I actually got the alarm in her face, but its not something I would expect from Snow. I see it as alarm and awe. So, what happens when Snow by Night receives her light from Blaise? my guess? the unicorn herself is visiting.